Running 3100 miles across the USA is a massive undertaking. Just like my 2007 run from John O'Groats to Lands End, I'll be running in memory of lost family members such as my parents Margery and Terry and my brother David. I don't want the dedication to lost loved ones to stop there, however. I want to open up this event to as many people as I can. Apart from the obvious effects of raising 10's of thousands of pounds for the 2 charities, it is my sincere hope that this run will have as far reaching an effect as possible and will serve to inspire and to give hope and comfort to as many people as possible. I know from the 1000's of emails I've received over the last few years, just how much the run in 2007 and the cause I was running for meant to all of those people who got in touch. It soon became apparent that for every 1 runner like me, there are thousands of stories of great loss but usually great inspiration also. With that in mind, 3000 miles of the run from California to New York in 2011 will be dedicated to the memory of a lost loved one. The name and dedication for each person will appear in a large leather bound book. This book will be produced in time for the start of the run and will be available for public viewing. At the time of writing, we are talking to Newcastle Central Library to have it housed in a glass case. The pages of the book will be turned each day as the run progresses. A copy of your entry in the book will also be sent to you separately as a memento to keep. It will also be possible to have a photo added in the book if required (If required, please email a photo for inclusion to sponsorship@rungeordierun.com). These people will be in my thoughts as I run each mile and I will most certainly hope to draw on the dedications left for inspiration as well as running in their memory. If you would like to dedicate a mile to the memory of a lost loved one then please complete this form. An amount, at your discretion, can be paid via justgiving.com or by cheque direct to the charities. Details of how to pay are shown after the form has been completed. 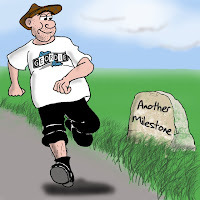 Any donation per mile would be gratefully received, be it £2 or £10. The important thing is that we can create a lasting memorial to those people who we love that are sadly no longer with us. Where has the t-shirt been this week? 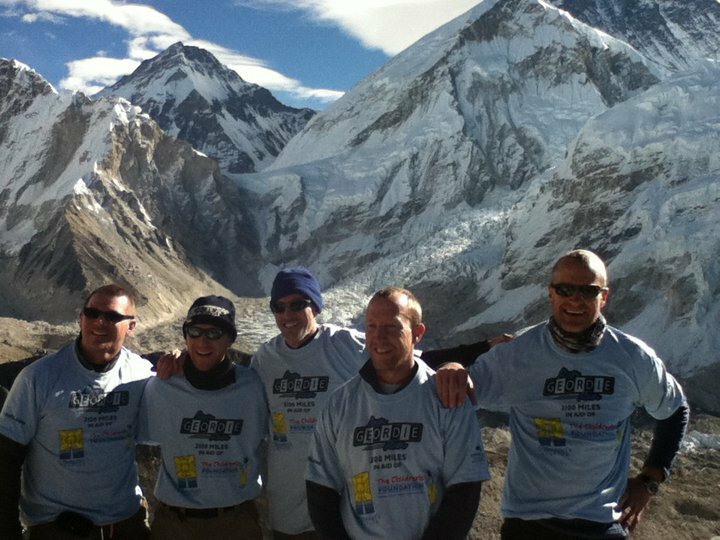 Thanks to David Cardwell (far left) and friends for sending this photo all the way from Everest Base Camp. There have been some pretty amazing snaps of the Run Geordie Run t-shirt over the last 2 years and this one is certainly up there with the best of them. Even more impressive is the fact that 5 Sherpas are now the proud owners of these t-shirts. If you would like to order the latest in Nepalese fashion then please click here. The sponsorship of last weekend's Castle to Keep Challenge by Rosewill Cottage saw the overall charity fund pass the £19,000 mark. In addition to that there were a few more donations during the course of the run and, at the time of writing, the current total is £19,240.34. The pleasing thing from my point of view, though, is that there is only £1,240 to be collected after the run. i.e. traditional sponsorship payable upon successful completion of running 3100 miles across the USA. £1,423.68 is owed now and I'm chasing the small number of individuals for that. That means that £16,576.66 has been sent to the 2 charities already. At the end of the year I'll publish a full breakdown of the overall total. It's something I do with both charities on a regular basis and always makes for interesting reading. The total amount is made up of all kinds of donations. I, and I'm sure the 2 charities too, sincerely appreciate the small pledges just as much as the large ones. Thanks again to everyone who has made a donation at www.justgiving.com/rungeordierun1 or www.justgiving.com/rungeordierun2. 31.8 miles from Otterburn to Newcastle Keep was enough to see a successful outcome on the Rosewill Cottage Castle to Keep Challenge. Mike and Ian finished at 16:50 and I crossed the finish line at 20:20. As I write this, unable to sleep, I'm in a blistered mess but that's 107.1 miles in mostly soaking wet conditions for you. The full extent of the damage sustained is an inflamed right shin, horrible chafing, numerous blisters and feet that generally feel like two clubs of meat with little movement in the toes. In other words, nothing I haven't experienced before during distance of this kind. It's bringing back memories from the first few weeks when I ran from John O'Groats to Lands End back in 2007. It's only as I've come to stop running that the pain is at it's worst. Pain aside, I can't tell you just how pleased I was with my performance over the 3 days. Energy levels never wained. Hydration was spot on. Out of the 107.1 miles done, I ran all but a few hundred yards. I also took very few breaks choosing to attack the huge mileage each day (36.3, 39 and 31.8). The route itself was very tough with climbs out of Edinburgh, out of Stow, up to Carter Bar and out of Otterburn providing particular challenges. It's one thing to run 107.1 miles in 3 days but to do it in cold, dark, wet and dangerous conditions and up and down some fantastic terrain, borders on insanity. The run panned out just as I thought it would and, as a result, I found myself pretty well mentally prepared for it. I had a bad spell from mile 30-35 on day 2 but nothing a few friendly text messages and a phone call home couldn't cure. Over 12 hours of running 39 miles on day 2 was very tough indeed. It made today's 31.8 seem easier in comparison. I'll take stock over the next few days and try to figure out exactly how I managed to run that far just 6 months after breaking my ankle and with only 3 months of training. In the meantime, thanks to Carlton for some absolutely first class road side support. Thanks also to Mike and Ian for some good banter and for adding a lot of running class to the event. Thanks also to the kind folk who donated via www.justgiving.com/rungeordierun1 and www.justgiving.com/rungeordierun2. You helped get the overall total up to £19,220.34. The immediate challenge now is to try and get some sleep. It's going to be easier said than done in this world of pain I'm in. Just about 14 left to do. Currently enjoying soup in Belsay courtesy of Mrs Run Geordie Run. I've never before put in a shift on the road like I did yesterday. Particularly after having ran 36.25 miles the day before. Today's haul of miles was a whopping 39 from Jedburgh to Otterburn! That's 75 done in total in 2 days. Mike and Ian finished around 18:30 but it was a 22:00 finish for me in pitch black conditions from Carter Bar. It was at this point that I sent support cyclist man Carlton on his way too and he finished just ahead of Mike and Ian. There were some pretty low and lonely moments out there on that last stretch, I can tell you. I spoke to Katy and Jack (Mrs Run Geordie Run and Run Geordie Run Jr) a few times and that really helped. What also helped, with 2 miles to go, was the following message from Ivan Hollingsworth on Twitter: "U R A LEGEND. Wot u'r doing is an inspiration 2 me. Stay strong & remember all the lives that will improve from wot our doing". The lads (who have been amazingly supportive) managed to get some pasta from the local pub and I had to force that down having had 6 energy bars and 4 energy gels during the day. I've had a decent night's sleep but it took until 1 in the morning for the aches in my legs to subside. I seem to have acquired a few blisters and my right shin is slightly inflamed. Today is all about getting to the finish no matter what. It's not going to be pretty but it does have to be effective. Thankfully, it's only 31 miles to Newcastle from Otterburn. I'll be giving it everything to finish The Rosewill Cottage Castle to Keep Challenge today. Thanks to everyone who has sent a message of support on Facebook and Twitter. Finally, thanks to those kind folk who have made a donation at www.justgiving.com/rungeordierun1 and www.justgiving.com/rungeordierun2. Much appreciated! 9 miles done on THE ROSEWILL COTTAGE CASTLE TO KEEP CHALLENGE. Just a marathon distance left to do. Thanks to those kind folk who have made a donation via www.justgiving.com/rungeordierun1 or www.justgiving.com/rungeordierun2. First 3 miles done on THE ROSEWILL COTTAGE CASTLE TO KEEP CHALLENGE. I don't feel too bad but today promises to be slower than yesterday for me. The 2 Hobbits, Mike and Ian are a few miles ahead. Head down, time to get stuck in to the A68. 36.25 miles done. Very challenging but a great days running on THE ROSEWILL COTTAGE CASTLE TO KEEP CHALLENGE. 9 miles done already on THE ROSEWILL COTTAGE CASTLE TO KEEP CHALLENGE. The whole team are feeling good so far. Well worth a read - http://www.superkrush.com/blog/. The current highest bid for the sponsorship of the Castle to Keep Challenge is £200. Thanks to Dawn McLean for her bid via Twitter. It's a whole 6 months since that punctured tyre caused me to fall off my bike, breaking my right ankle. The resulting operation to insert 2 pins into the ankle seemed like the right thing to do at the time. 6 months down the line that decision now seems like a masterstroke and I'm well on the way to getting the strength, that I had in May, back in my legs. Following a good period of rehabilitation I'm happy to report that The Paddy Power Bionic Ankle ™ is in absolutely superb fettle. In fact, it is almost the same shape as my other ankle. Since my return to running following the period of rehab, my training has been going well with plenty of long runs. Despite being very slow, I've never been in any danger of failing to complete the distances I've attempted. An added bonus is the fact that the day following a long run I feel that there has been very little pain and stiffness in my legs. The time is, therefore, right to step things up and see precisely where my endurance and recovery levels lie. In an attempt to do just that I will be running from Edinburgh to Newcastle this weekend. This Friday at 9 am, I will be accompanied by 2 other runners and a cyclist as we start our journey from Edinburgh Castle to the Keep in Newcastle. This latest configuration of "Team Run Geordie Run" will take 3 days and 105 miles to complete this cold, dark and damp run. I regard this particular event, which I'm calling the Castle to Keep Challenge, as far and away the biggest test I've had in the build up to USA 2011. In fact, it's probably the biggest test since I ran from John O'Groats to Lands End back in the Summer of 2007. Team Run Geordie Run for the Castle to Keep run will consist of veteran Mike Lewis, club runner Ian Young and myself running. We'll be supported by Carlton Fletcher on his bike carrying "1 or 2" of our luxury items in his panniers. Had I not broken my ankle then this event would have happened in August. As it turns out it has to be done in more difficult conditions. For one, it's going to be one hell of a lot colder than August with less daylight hours. This is my main concern and good discipline will be needed to set off on time each day. We need to give ourselves a good chance of finishing each of the 3 days in daylight so 9 am starts will be on the cards each day, if not earlier. Unlike myself, Mike and Ian are built like runners. They are both about the size of a Hobbit and are very good when it comes to speed and distance. I fully expect these 2 to be finished well ahead of me on each of the 3 days, Thankfully, Carlton will be around on the bike to ensure I get to the end safely (won't you Carlton?). Over the course of the 3 days, I'm expecting thousands of hits on this website (mainly via publicity from www.nufc.com) and lots of interest on Twitter. With that in mind, I'm currently looking for a sponsor of this run with all proceeds to be split between The Children's Foundation (Charity No 1000013) and St Benedict's Hospice (Charity No. 1019410). The run will be known as "The INSERT YOUR NAME HERE Castle to Keep Challenge". The event and your name/company name will get mentioned on this website, on my Twitter page (currently 3,495 followers), on Facebook (currently 1550 followers and over 400 friends) and there is a very good chance that it will be mentioned on www.nufc.com. 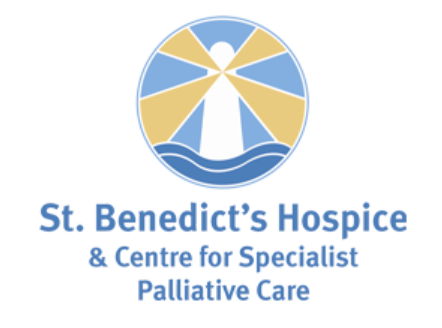 I realise that it's the excellent Children in Need event this Friday but we have some children in need of our own right here in the North East so please support The Children's Foundation and of course St Benedict's Hospice. Get bidding folks and help make this weekend's journey a success. This is the route Team Run Geordie Run will be taking. Click on it to be taken to Google Maps. Day 1 of the Castle to Keep Challenge is from Edinburgh Castle to Melrose. Day 2 is from Melrose to Otterburn. Day 3 is from Otterburn to the Keep in Newcastle. The Run Geordie Run Training Summary is brought to you in association with Northern Runner, 52 Low Friar Street (Just down from the Gate), Newcastle. Why not visit the Northern Runner shop and let the experts examine your feet to recommend the best shoe for you. Alternatively, click on the link to the left to go straight to their website. Wednesday 27th October 2010 - 5.75 mile run. Jesmond Dene. (01:34:02). Sunday 17th October 2010 - 22 mile run, Middleton to Castleside. (01:05:22). Tuesday 19th October 2010 - 13 mile run, Gosforth to Hamsterley Mill. (02:38:16). Friday 22nd October 2010 - 10.9 mile run, Gosforth to Rowlands Gill. (02:09:13). Sunday 24th October 2010 - 20 mile run, "The 3 peaks". (04:36:49). Monday 11th October 2010 - 5 mile run, Race Course. (00:45:54). Wednesday 13th October 2010 - 2.4 mile run. Tynemouth to Dave Fairlamb's gym. (00:26:15). Wednesday 13th October 2010 - Personal training session. (01:00:00). Wednesday 13th October 2010 - 8.2 mile run. Dave Fairlamb's gym to Gosforth. (01:34:02). 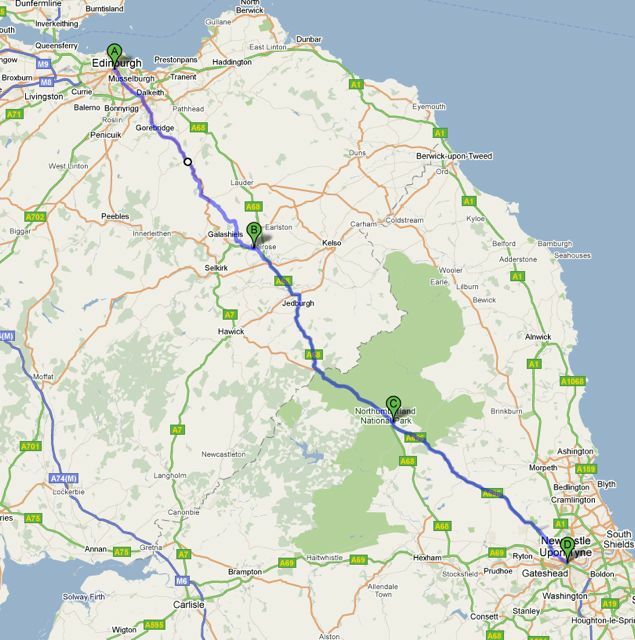 Sunday 17th October 2010 - 20 mile run, Shotley Bridge to Newcastle to Metro Centre. (03:51:27).